President Paul Kagame has expressed need for Africa to work together to harness its financial and human resources. He was speaking at a roundtable meeting on the UN Sustainable Development Goals (SDGs ) taking place in Ghana. The meeting that is being hosted by Ghanaian President Nana Akufo Addo is focusing on how to mobilize support and accelerate the implementation of SDGs. President Kagame urged fellow Africans to work hand in hand and take the private sector as well as women and youth on board. “The continent needs to work together to mobilise resources, especially financial resources and people. Each country also needs its own champions to build consensus and drive results. They should be inclusive of private sector, women and young people represented,” he said. President Kagame also touched on two big aspects that can improve the SDGs. “First is the strong emphasis on the private sector as an engine to eliminate poverty, and create wealth, objectives that are at the heart of most of our national plans…secondly, we now have an ambitious development framework to engage all countries rather than just developing ones. Especially knowing that there re crosscutting issues that affect everyone,’’ he said. 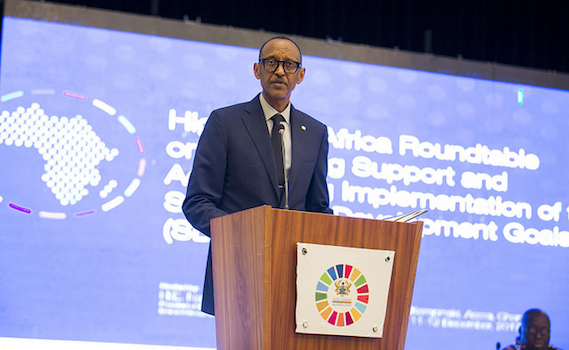 Kagame also pointed out that Africa faces a leadership gap as an obstacle to SDGs and argued that Africa’s time to take charge of its problems and seeking solutions is now. President Kagame (L), Ghana’s Nana Addo Dankwa Akufo-Addo (C), and AU Commission chairperson Moussa Faki Mahamat, discuss ways Africa should tackle its own problems during the summit. / Village Urugwiro. “It all starts with ownership and we have to take charge of our own problems. We have partners and friends that are willing to help, but we must not accept that they do everything for us,” he said. Meanwhile, Jeffrey Sachs of the Earth Institution at Columbia University as well as chairperson of the African Union Commission, Moussa Fakir Mahamat, the Libyan Alaa Murabit and Leymah Gbowee from Liberia, among other international dignitaries are attending the event. The theme of this meeting is “mobilizing support and accelerating growth of SDGs’’. Meanwhile, German President Franks Walter Steinmeier is also attending the three-day summit. Rwanda was privileged to host a ‘SDGs Centre For Africa’ that will help Africa in implementing its development goals after outdoing other countries in implementing the Millennium Development Goals also shortened to MDGs. SDGs aim at eradicating poverty, hunger and other major problems that face the population before 2030. These goals were ratified in the 193th UN General Assembly that took place in September 2015. “We need to involve everyone. We have all made commitments and statements of understanding on what needs to be done and we need to follow these up with actions. It can be done and we have seen it being done. 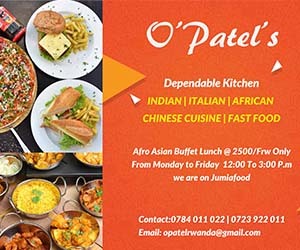 We need to accelerate what we are all doing,” Kagame said.